Board passes motion by Solis, Ridley-Thomas; departments begin investigation. 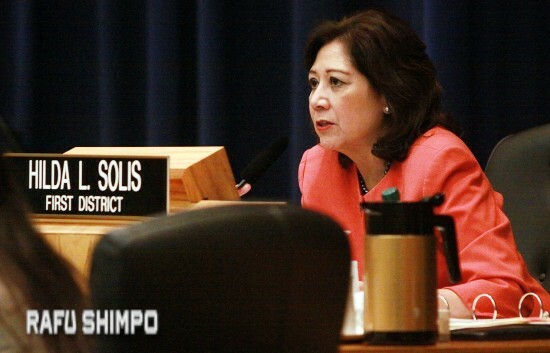 Los Angeles County Supervisor Hilda Solis. On Tuesday, the Los Angeles County Board of Supervisors officially got involved in the sale of Keiro Senior HealthCare’s four former facilities. Supervisors passed a motion that directs the Department of Consumer and Business Affairs, County Counsel, and Department of Public Health to investigate the sale of Keiro Nursing Home in Lincoln Heights, Keiro Intermediate Care Facility and Keiro Retirement Home in Boyle Heights, and South Bay Keiro Nursing Home in Gardena to real estate developer Pacifica Companies LLC, based on widely held public concerns over the transaction process, public welfare and resident security. The newly renamed Kei-Ai Los Angeles Healthcare Center, Kei-Ai South Bay Healthcare Center, and Sakura Intermediate Care Facility are operated by Aspen Skilled Healthcare Inc., while Sakura Gardens (retirement home) is operated by Northstar Senior Living Inc.
“Los Angeles County is now taking action to investigate the transaction and to evaluate the community’s healthcare needs, so that we can work to protect the welfare of these residents. 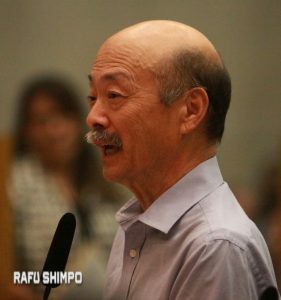 Keiro residents deserve transparency, security, and dignity—not to have their fate left to real estate speculation,” Board Chair Hilda L. Solis told The Rafu Shimpo on Thursday in an email. 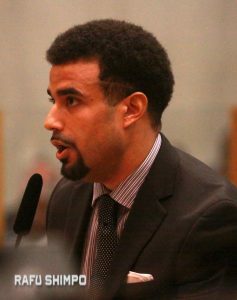 Agenda Item 51-B was sponsored by Solis of the 1st District, which includes Little Tokyo, Boyle Heights, and Lincoln Heights, and co-sponsored by Vice Chair Mark Ridley-Thomas of the 2nd District, which includes part of Gardena. “I was concerned about the allegations and wanted to ensure that the county takes steps to protect these impacted vulnerable residents,” said Ridley-Thomas. Dr. Takeshi Matsumoto and Dr. Keiko Ikeda, representing the newly formed Koreisha Senior Care & Advocacy, were among the speakers. Solis had previously sent a letter to California Attorney General Kamala Harris on Jan. 29, just prior to the completion of the sale, expressing her strong concern about the sale. 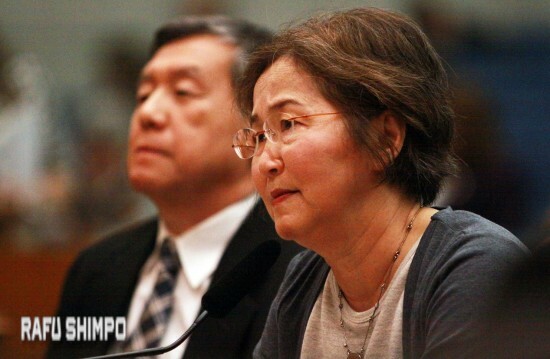 She also asked for the postponement of the sale and for a public hearing, which had been waived. The motion was prepared following a request letter to all the supervisors sent by Rep. Judy Chu (D-Monterey Park), on March 24. Sean Fleming Jr. spoke on behalf of Rep. Maxine Waters. Those joining Chu in urging the Board of Supervisors to investigate the sale of Keiro were Reps. Maxine Waters (D-Gardena), Grace F. Napolitano (D-El Monte), Mike Honda (D-San Jose), Doris Matsui (D-Sacramento), Lucille Roybal-Allard (D-Los Angeles), Tony Cardenas (D-Panorama City), Janice Hahn (D-San Pedro) and Mark Takai (D-Hawaii). Following the receipt of this request, Solis and Ridley-Thomas jointly drafted the motion and placed it on the April 12 board meeting agenda. 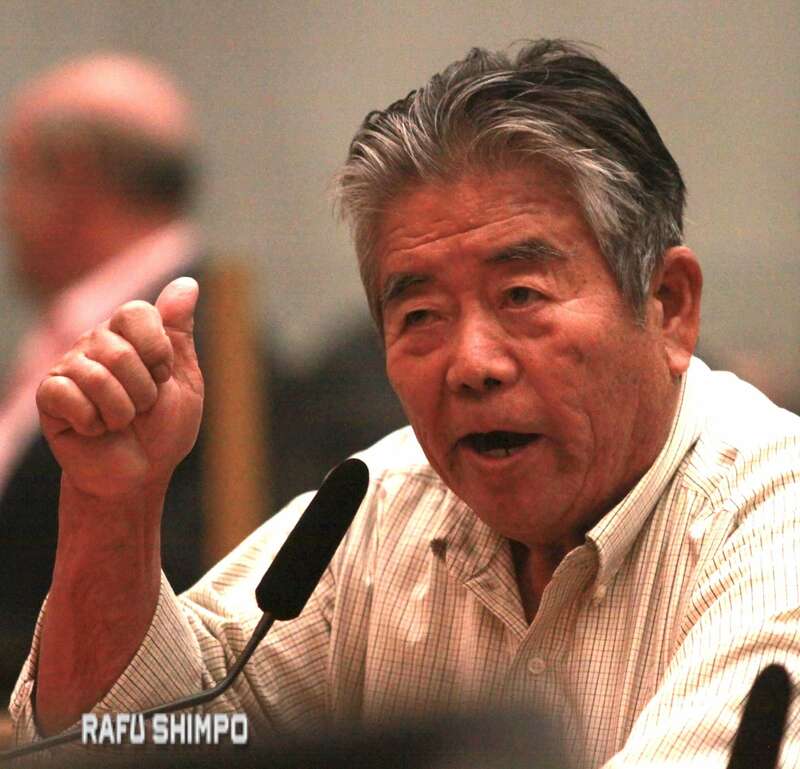 At the board meeting, Sean Fleming, Jr. from Waters’ office and nine individuals from the Japanese American community testified in favor of the motion. 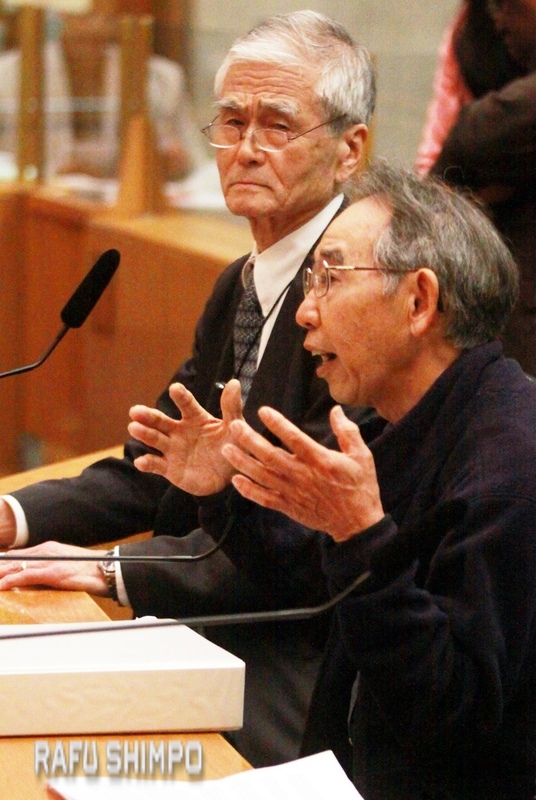 All nine were representing the nonprofit organization Koreisha Senior Care & Advocacy (formerly Ad Hoc Committee to Save Keiro): Ray Hamaguchi, Adelle Lutz, Seiji Horio, Mo Nishida, Charles Igawa, Ph.D., David Watanabe, Kenji Irie, MD, Keiko Ikeda, Ph.D., and Takeshi Matsumoto, MD. While the speakers, who were each given up to three minutes to speak, voiced their concerns, the supervisors listened attentively. Immediately after the conclusion of the testimonies, the motion was passed. While Solis, Ridley-Thomas and Sheila Kuehl (3rd District) supported it, Don Knabe (4th District) abstained. Mike Antonovich (5th District) was not able to attend the meeting, but “is supporting the motion 100 percent,” according to Tony Bell, a member of his office staff. Real estate consultant Ray Hamaguchi. Seiji Horio of the Southern California Gardeners’ Federation. She also pointed out the reasons for the staff leaving included the fact that they lost seniority under the new ownership, and their health insurance plan changed to another one with a much higher premium that they could not afford. Further, she said, many volunteers have stopped volunteering, so there is no provision for Japanese cultural activities tied to their heritage. “Without the language capacity and the resources provided by staff and volunteers, culturally sensitive services are impossible and cannot be provided,” Ikeda observed. Entitled “Analysis of the Sale of Keiro Senior HealthCare Service Facilities,” the motion describes Keiro’s four former facilities and past six months’ anti-sale movement, supported by members of Congress and the State Assembly, which asked Harris to postpone the sale and hold a public hearing. Dr. Kenji Irie (left) and David Watanabe address the supervisors. 1) Resolved that the welfare and safety of Keiro residents is in the public interest. 2) Directed the director of consumer and business affairs, in coordination with county counsel and the interim director of public health, to investigate claims of wrongdoing during the course of the transaction. 3) Directed the interim director of the Department of Public Health to provide information on skilled nursing facilities located within a five-mile radius of Keiro Senior Healthcare facilities, the ability of these facilities to address the multiple language needs of residents, and the current evidence base and best practices related to social and community needs of seniors, and report back to the board in 60 days with this analysis. 4) Instructed the county’s chief executive officer to prepare a five-signature letter to the attorney general urging her to help protect county residents by dedicating sufficient resources to monitor and enforce continued compliance with the conditions of sale, and to ensure appropriate community oversight of the facilities. 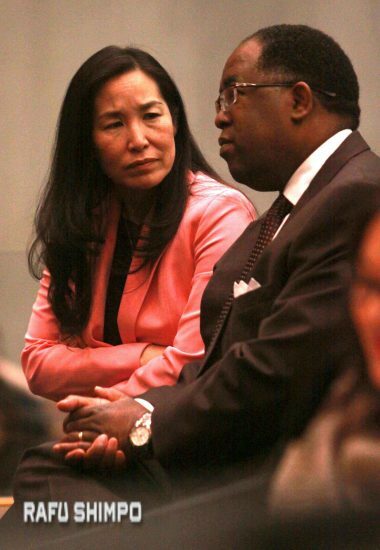 Los Angeles County CEO Sachi Hamai and Supervisor Mark Ridley-Thomas. “1. The State Department of Fair Employment and Housing is investigating civil rights complaints related to disability and civil rights violations of the residents, including mental and emotional suffering. “2. There are also allegations that Keiro raised money for its restricted endowment fund, while at the same time planning the sale of the facilities, which could constitute fraud on its donors. “3. There’s also the question of the waiver of a public hearing by the attorney general and lack of disclosure to residents and employees by the Keiro Board. “4. There may have been impact to the employment rights of Keiro workers. “5. There are also concerns that the Community Advisory Board established by the AG is not functioning properly. In the meantime, the question remains — how much influence does the Board of Supervisors actually have over the Keiro sale? 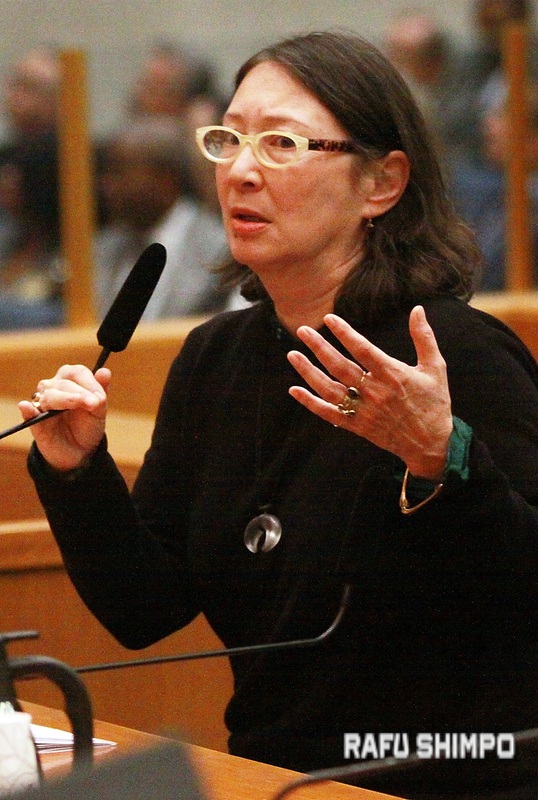 “The county’s power is very limited on this issue,” said Ridley-Thomas. Adelle Lutz of Koreisha Senior Care & Advocacy. The Board Chair of Keiro Senior HealthCare Gary Kawaguchi commented, “We’re disappointed that there continues to be such divisions within our community. Our hope is to move forward working together with community members, community organizations, Aspen, Northstar and Pacifica to enhance the quality of life for our seniors in the community. “Our intention has always been to position the facilities as strongly as possible, in the best interest of the residents. Keiro remains committed to meeting the evolving needs of our aging community while being a good steward of precious and limited resources, taking a thoughtful and deliberate approach in developing future programs to ensure we are making wise investments that improve the health, well-being, and quality of life of seniors in our community. If the facilities are only at 88% capacity, why was I told repeatedly, when inquiring about placement, that there is a one year waiting list?